There have been numerous posts here about carrying firestarters as part of one's EDC. I've been carrying two packages for about 6 months and both have proven effective and reliable. I mostly carry in urban settings or while traveling by car or train and do have to be sensitive about controlled entry to govt. buildings. I haven't had a problem passing thru security checkpoints with either item. Lots of folks have the 'peanut' lighters. My problem in the past with them, as with most liquid fueled lighters, is that the fluid dries out. I ordered a Delrin CR-123 battery holder and the mini peanut lighter from County Comm. The lighter fits nicely inside, though I added a cotton ball in the bottom of the container to keep the lighter from rattling around. After 6 months of EDC the lighter has retained fluid enough to light easily and produce a reasonable flame. The other packaging technique is to use the small plastic boxes from CC (just a frequent customer) to hold a mini-Bic and some tinderquick. Tucking the lighter in the case seems to protect it from the gas escaping inadvertently. There's also room for a Sparklite as well. The peanut lighter has been on my key ring and the mini-Bic in my daypack for about 6 months so this is a good, real world test. 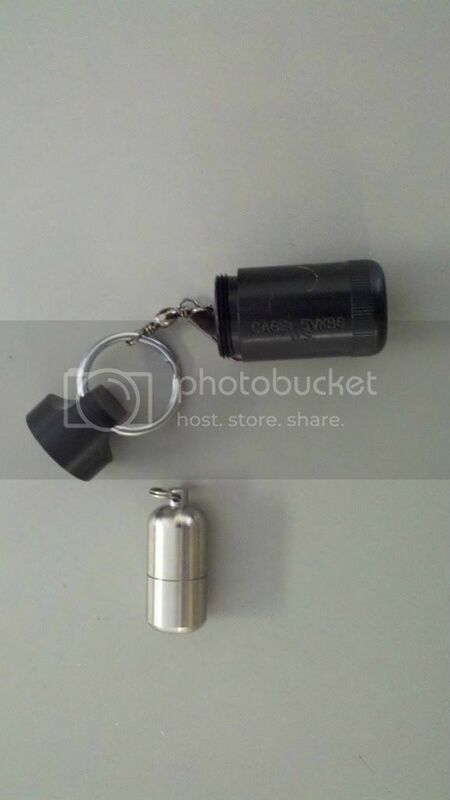 I find that using a fishing swivel really keeps the tops of things from unscrewing themselves, such as pill fobs or the cylindrical battery cases from County Comm. For EDC, I also carry a mini Bic or a peanut lighter. I carried a mini Bic for about a year with no leaking issues. I prefer the mini Bic because it is more rugged and just works. I'm currently carrying a peanut lighter to test real world carry conditions. 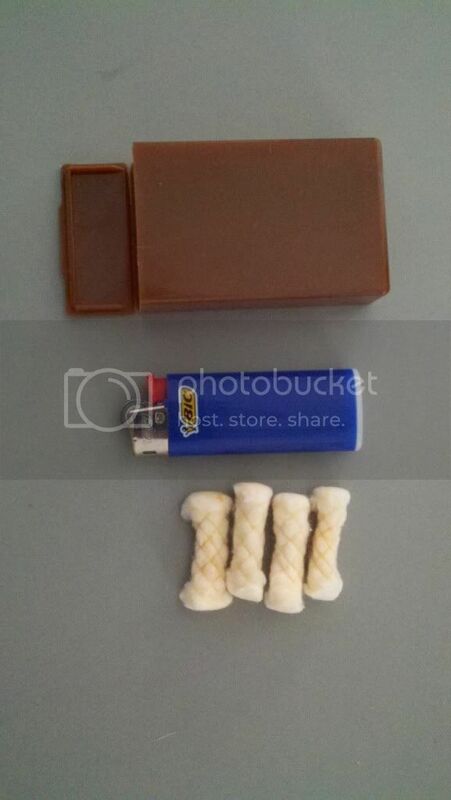 The peanut lighter is slightly smaller and nicely fits on a key chain. I have had no leaking problems with either of these. I have left a peanut lighter alone for a year, and it still lit up. If your peanut lighter leaks, there may be a problem with the O-ring. I personally have not found suitable replacement O-rings on the Internet. If anybody has a link to the correct O-ring, then please share. For ensuring gas doesn't leak on a mini Bic, I cut a bike inner tube thin enough such that it fits the gap underneath the button. I installed the bike inner tube there and double it over for added tension, like one can do with a rubber band. For the peanut lighter, I wrapped the exterior with bike inner tube, which is not intended to prevent leakage. Rather, the bike inner tube is tinder and also dampens clanking with other objects. In everyday situations, I rarely use my lighter for anything. It's mainly there "just in case". I'm contemplating moving back to a tiny ferro rod and scraper to carry on my person at all times. That way, I don't have to worry about temperamental issues like fuel leakage. The "small plastic box from CC..."
I have carried Bics and mini-Bics for years without issues. They have always lit reliably, with no cases of leaking. I typically have at least one in my cookset where it is well shielded from bumps and knocks. Others have been in pants pockets and loose in packs without any problems. Thanks. I have had problems with the peanut lighters drying out, mostly, I think, because of O ring failures. I did find a rather extensive set of O rings at SciPlus.com. for $14.50. I prefer not to use rubber bands or zipties to prevent the Bic lighter valve from leaking because when I'll need it the most is when my fingers will likely be cold and clumsy. 2. Soto torch lighter which turns a Scripto disposable lighter into a 2,300*F blowtorch. Which I actually used (to shocked applause I had on me) when a friends creme bruelle torch ran out of fuel during a party. And assorted Wet Tinder and Coghlans firestarter tabs. I have a drawer full of former EDCs like the orange Sparky Fire Starter, blast match, etc. picked one up at Wally World for six bucks- it cost more than a Bic, but about the same size, metal, with cover, and mostly windproof- and refillable. I have had one for 5 years- its not as shiny anymore, but still works every time.